The "GOOD CATCH” Award is designed to recognize staff members committed to patient safety. 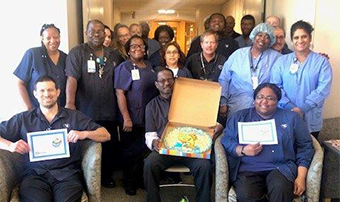 “The GOOD CATCH” Award for November goes to Josh Leftiz and Kesha Ford in the Methodist Hospital Environmental Services Department. While on routine duty, Josh and Kesha recovered two SCD pumps that were able to be cleaned and returned back to service for patient use. One of the SCD pumps was found in a dumpster! These pumps cost the hospital approximately $2,000 each, so KUDOS to them for being extra diligent and looking out for the organization when it comes to financial responsibility. Everyone plays a role in patient care and fiscal responsibility when they’re at work! Thanks to our two honorees, we were able to prevent a financial loss to the hospital, return these two pieces of equipment back into operation, and continue to provide the best care to our patients! Great job Josh and Kesha… and thank you for your dedication to Methodist and our patients!